I used to prepare stuffed rice but this time just for a change, I stuffed aval/poha upma. I used idly steamer this time to cook the bell pepper. You can use oven to prepare these stuffed dishes. I'l come up with another dish using oven method soon. 1. 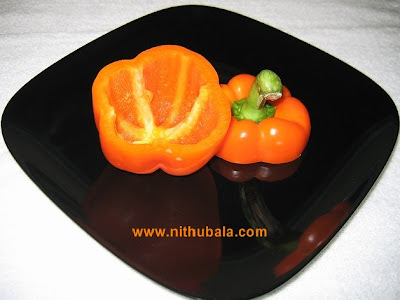 Wash and dry Bell pepper. 2. 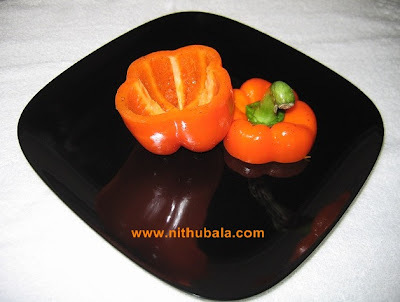 Cut the top of the bell pepper. Remove seeds. 3. Brush some oil and throw some pepper and salt. Keep aside. 4. Now, in a pan add oil. 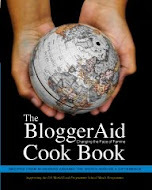 Pop mustard and then add urad dhal. 5. 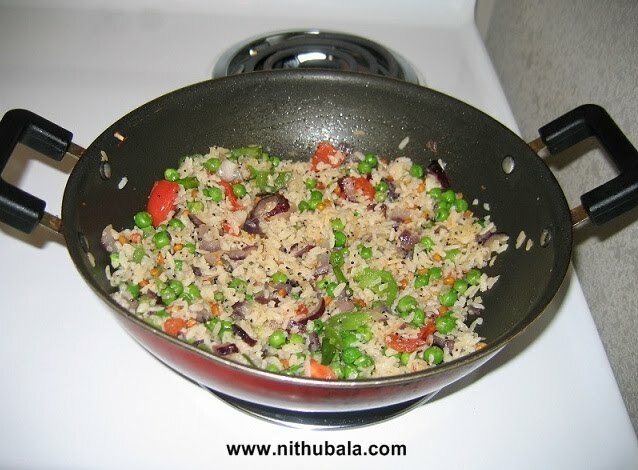 Add chopped onion, tomato, bell pepper, green chillies and peas. Fry well. 6. Add soaked and squeezed poha. Mix well. Cook for 5 minutes. Keep aside. 7. 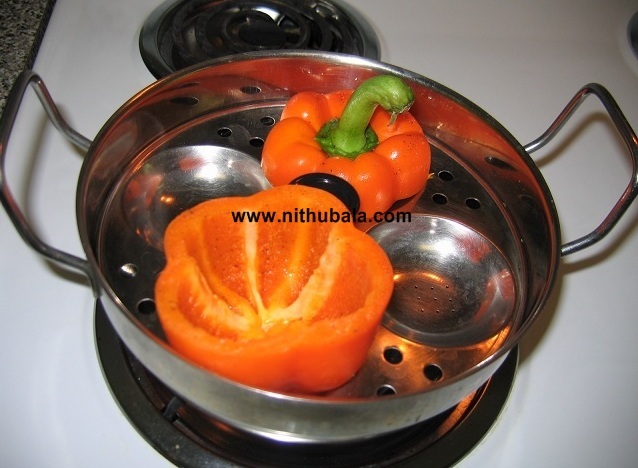 Now, Place the bell pepper in idly steamer. Steam for 10 minutes or till cooked. 8. Now, stuff it with the poha upma. 9. Cook for another five minutes. 10. Enjoy hot with Sauce or Chutney. 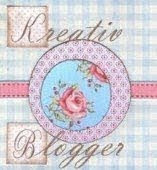 Hi Nithu ,Hope ur doing great dear .. Always tried meat stuffing in my peppers but this looks so interesting! Will surely try this. Very nice step by step process. Looks so delicious.. Very tempting.. Very innovative one. 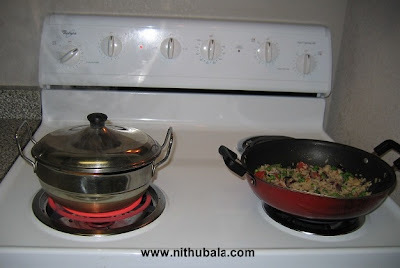 Loved the idea of stuffing poha upma. 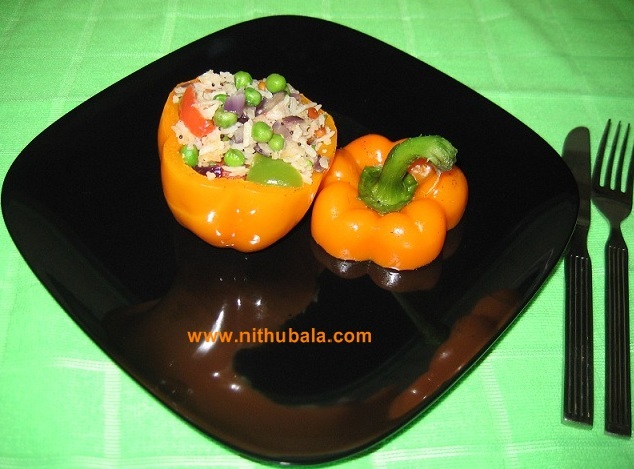 Delicious poha filling inside steamed bellpepper.Love the flavor of bell pepper with poha. Colorful pepper with a delicious upma. Great pic and tasty dish! 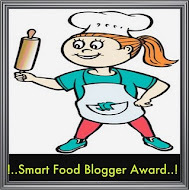 This is a fantastic idea..Delicious stuffed upma!! Beautiful dish, simply tempting and very delicious.. I like the idea of stuffing Poha..gotta try soon ! 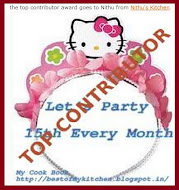 Hey Nithu, thanks for letting me know about the event.. I've sent the details to your email id. 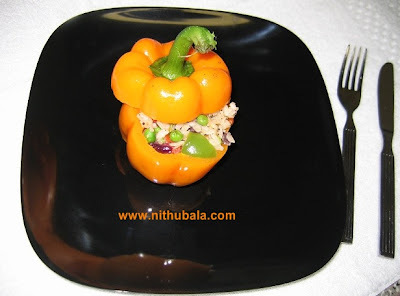 By the way your stuffed bell pepper with poha upma looks awesome. 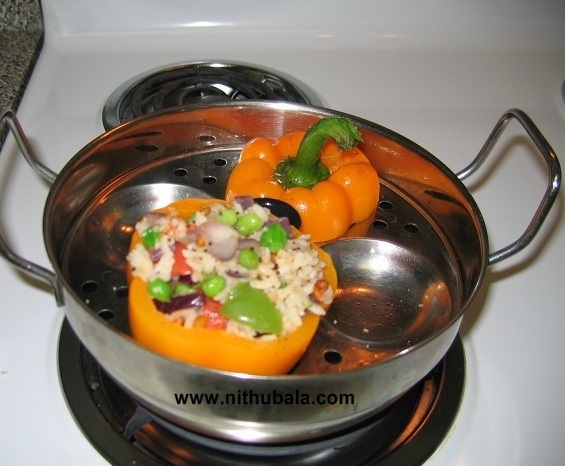 The pics came out stunning..
looks awesomely good..luved ur cute ltl idli steamer..its quite different. 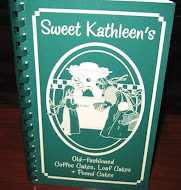 The filling sounds delicious, too! 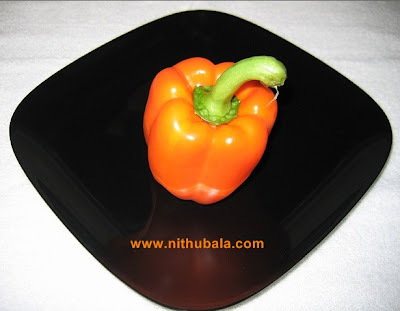 Thats super cool recipe Nithu, love the colour of the capsicum and loved the idea of steaming in idly plate! The color is so attractive and love the idea of stuffed upma.. classic..